Over 200 boxes in the gallery represent import and export items of the past 150 years. Exhibitions are like the arrival of a new baby. There may have been months of anxiety and discomfort but once the day arrives, it is hard not to sit back and enjoy the accomplishment. 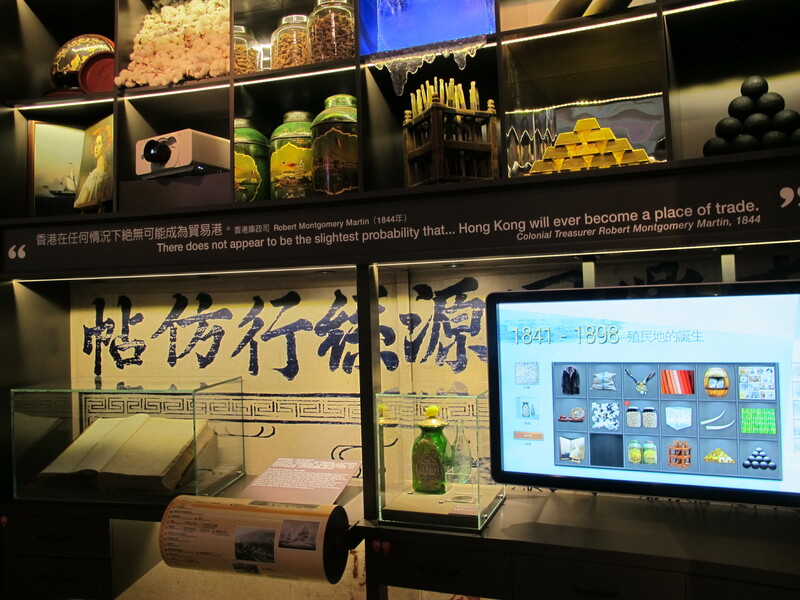 Last Friday a major exhibition entitled Made in Hong Kong – Our City Our Story opened at the Hong Kong Maritime Museum. The exhibition was primarily funded through a generous gift by HSBC. I was pleased to be part of the team that put this show together. 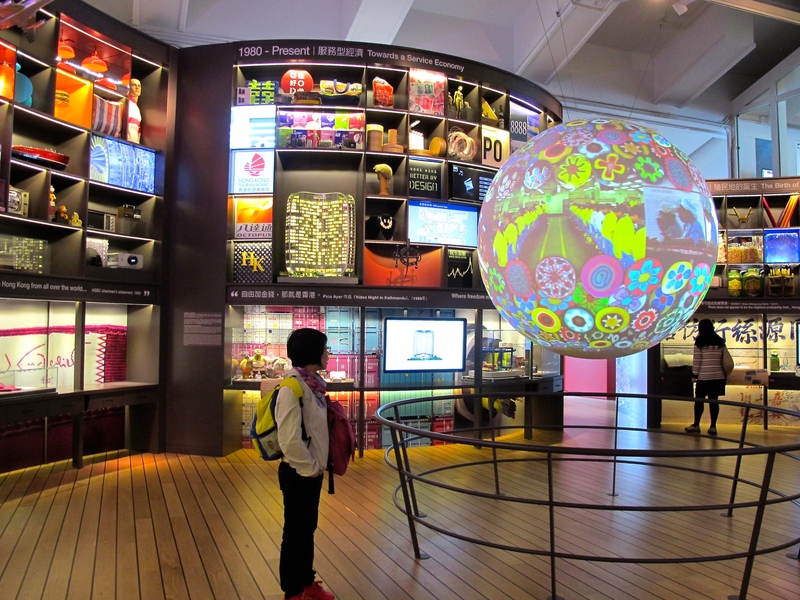 I am also pleased to take some credit for spearheading two of the major components of the show, the Science On the Sphere (SOS) multimedia display and the touchscreen displays for the Trade and Commerce Gallery. The exhibition designer created the framework. The Trade and Commerce Gallery would be filled with hundreds of items representing different import and export commodities and services of the past 150 years. Positioned in specially designed cabinets – the site is a visual feast for the eyes. Second – the SOS would be placed in the center of the gallery. How to tie it all together? Each of the sections of the gallery have touchscreen computers that allow that visitor to explore the boxes further. Although my contributions to the exhibition are bringing multimedia and artifacts together, the key for me in this case is always focus on the story. Without a story, it doesn’t matter how impressive the technology is. Hong Kong’s story is how this small geographic location in Asia became a part of the greater global economy. And not only is it a part, for the past 150 years, it has been a leader. That’s the story. So all my efforts are to make those connections. Whether it is an ice block that was transported to Hong Kong from New England in the 19th century or Mattel’s Barbie Dolls ® that are shipped through our port all over the world – I put into place a narrative story that brought those desperate things together. The show will be up for the next six months. I hope you can all visit. I will be handing out cigars in the lobby. 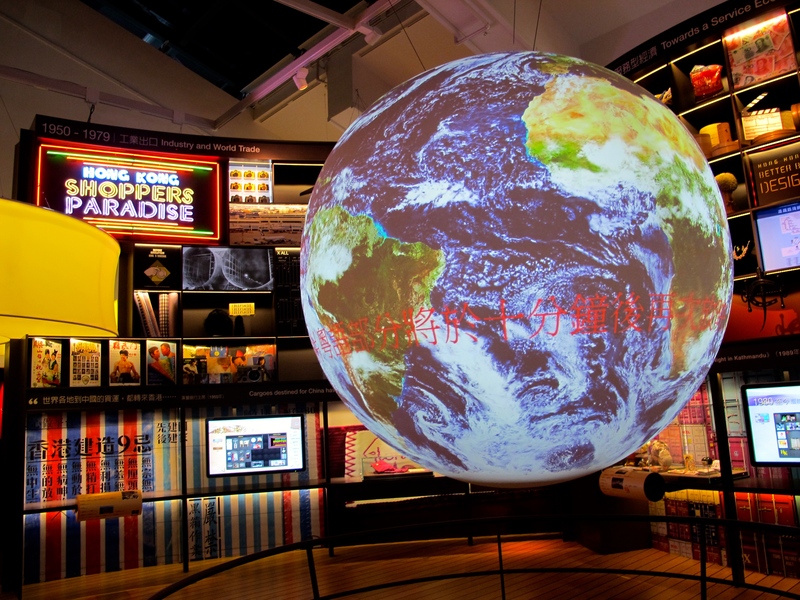 The 360 degree projection surface adds a new level of display for the gallery. In the summer of 1986 I purchased my first car, a 1967 Ford Mustang. It was the beginning a life-long interest with a vehicle that is an American icon and a piece of automotive history. 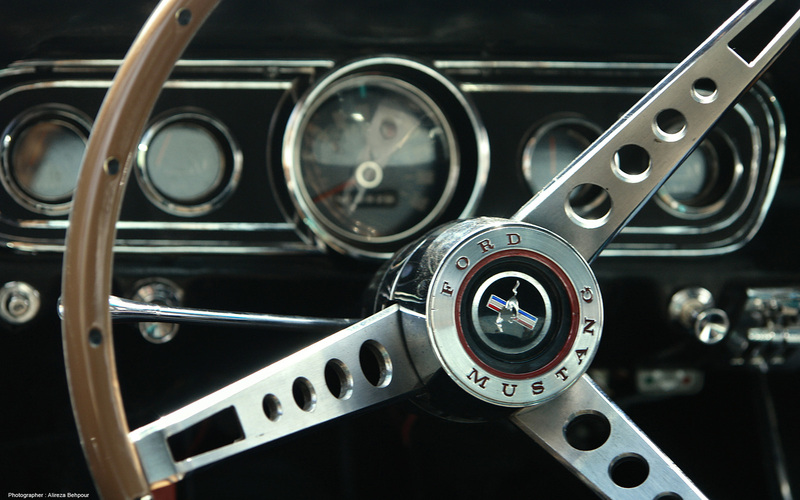 In the 1960’s the Mustang was the leader of a new category of cars known as the Pony Class. The Pony Class spawned a new type of vehicle for people who were looking for style, power and affordability. Cars are a passion for me and that is why I was excited to join Hong Kong’s first Annual classic car show, the HK Classic Car and Vintage Festival. This is a three-day event that will be held in October that highlights the best classic cars and motorcycles of the area. The event will also play host to a number of opportunities like talks, vintage fancy dress, family activities, music and food. I will be hosting a talk at the festival of the Pony Class of the 1960’s and how it shaped the American car industry. This is a hot topic because even today people feel very strongly about the brand they support. I believe strongly that it was the rivalry between the Mustang, Camaro, the Barracuda, the Challenger and their subsequent Pontiac, Mercury and General Motors spinoffs that made this class great. I will also be helping to curate an exhibition on classic cars that have shaped Hong Kong. Although Hong Kong is not known as a manufacturing site of cars, it is the home of every major dealership including the high-end luxury brands that come out of Italy, Germany and Britain. Check out the HK Classic Car and Vintage Festival website to find out more about this unique opportunity in Hong Kong.